Stepping into a new place for the first time can be intimidating - how do you know what to expect or where to go? The same applies to apps: the onboarding process is the first experience users have when they arrive in your app, so it needs to work hard to ensure that they don’t want to head straight back out. Making sure that customers return is crucial. After all, improving your retention rate translates to an improved return on your acquisition costs. However, convincing a user to return means delivering a flawless first time user experience (FTUE) that succeeds in the tricky areas of sign up, permission requests and feature discovery, any or all of which can make the difference between retention and churn. If an app doesn’t optimize this process, it’s likely to be the only experience of your app that some users will have. Discussing the theory behind best practice for apps is all very well, but the best way to demonstrate this is with real world examples and first hand experience. In the name of research, I downloaded a dozen apps from different verticals, all with high app store ratings, and went through their onboarding process as a first time user. The following examples show some of the most effective ways that these apps tackle the potentially tricky area of FTUE, and succeed from a user’s perspective. The real test, of course, is whether any of these apps made me want to become a regular user, and I can report that the three apps featured below will all be staying on my phone screen, for the time being at least. At their core, the purpose of apps is to make our lives as convenient as possible, so a lengthy sign up form is obviously likely to turn users away. Whilst the budgeting app Wally was one of the few apps I tried that didn’t offer sign in via my Google or Facebook accounts, you really can’t ask for a more straightforward sign in form than just two fields. There are two features that make Wally stand out, and the first is when it requests sign up. Rather than popping up as soon as you enter the app, Wally lets the user swipe through a carousel of graphics showing off what the app can do first, and then asks for those two small pieces of information. There’s psychology behind this: giving users value before asking them for something in return makes them more likely to agree. The second feature that makes Wally’s sign up screen memorable is the phrase ‘Why are you asking me for this?’ across the bottom of the page. The small, grey writing might seem easy to miss, but that’s partly why it works. It isn’t intrusive enough to clutter the screen, but if you’re a user wavering on the edge of sign up, it could make the difference between you giving your details, and you clicking away. 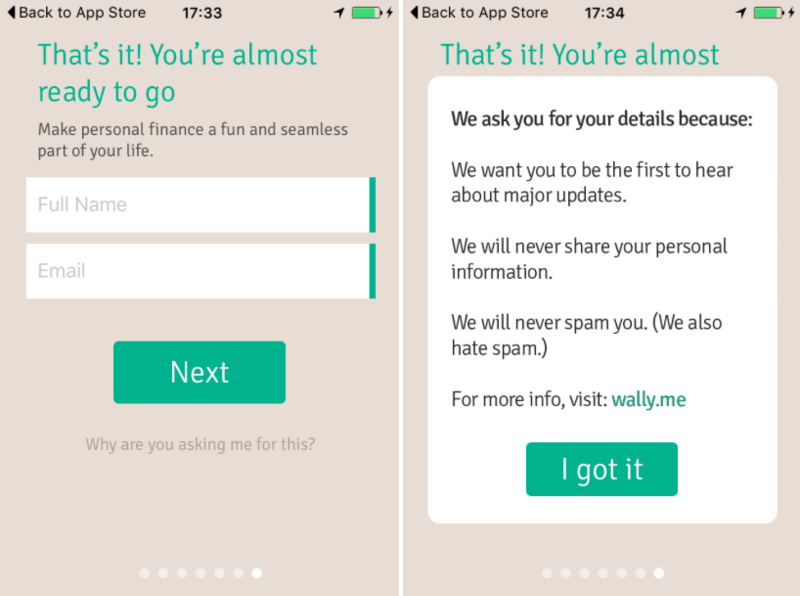 Where most apps demand sign up, Wally asks politely, and offers a message that explains, reassures, and even links to their website for more detail. Most apps will need to request permission for something, whether that’s push notifications, location data or access to your contacts. Whilst there are several techniques for making those requests a success, there are essentially two golden rules: explain why you’re asking, and time your request right. 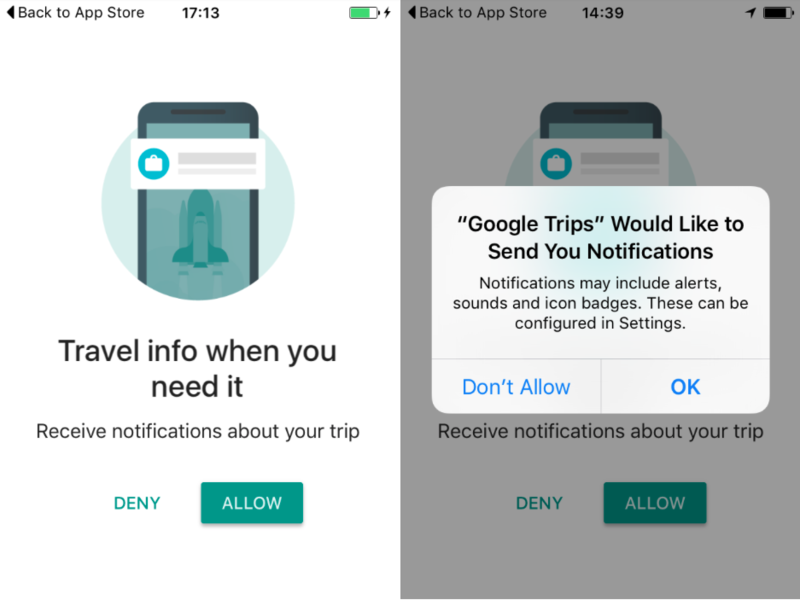 Although Google Trips doesn’t personalize the default text on their notification permission message, the app preempts it with a screen letting you know what they’ll be using those notifications for. Trips emphasizes the need for travel updates, rather than the fact these will be delivered via push. Preceding it with their own screen also allows Trips to use their powers of suggestion: ‘Allow’ is highlighted with a coloured button, making sure that this is the response you notice first, and by using ‘Deny’ instead of ‘Don’t Allow’, they make rejecting the permission seem very final. Clever Google. Like Wally’s sign up form, the permission requests are shown at the end of Trips’ carousel, giving context to the types of travel info they could be providing you with. This might sound like basic advice, but in the majority of apps I tested permission requests were the first thing you were faced with when opening up the app. Just as if someone approached you and asked for a favour before they’d even introduced themselves, this approach is more likely to result in dismissal. No matter how intuitive your app’s user interface might seem, chances are that at least some new users will need a bit of guidance. Since using Wally is reliant on inputting income and expense data, this is clearly an app that needs instructions. As you navigate through Wally for the first time, text bubbles pop up letting you know not only what the icons mean, but also what they can do and how to use them. Several of the apps I tested spit you out onto the home screen as soon as you’ve signed up, leaving you desperately clicking on anything in sight. Soundcloud, for example, left me on the home page without telling me how to use the different tabs, or save tracks, or use the ‘stations’ tool. Wally, on the other hand, cuts out the frustration of trial and error, and means you don’t leave before you’ve even tried the features out. A slightly more impatient user might see the amount of text in these pop ups as slowing down their first experience, but for building long term use patterns, enabling users to make the most of the app is worth investing time in. You’ve signed up, you’ve been shown how it works, and then… well, where to begin? 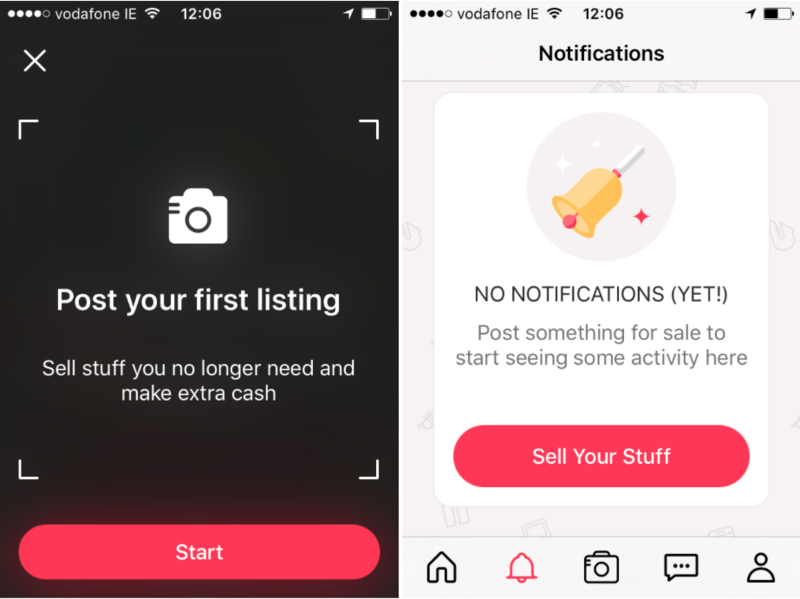 Browsing aimlessly quickly becomes boring, so instead why not guide users towards their first step like buy-and-sell app Letgo. The final onboarding screen takes you straight into posting your first listing, which also serves as a platform to request camera permissions early on. If you choose not to post now, as you click through the interface there are several features that won’t be active yet. Instead of just leaving them blank, Letgo displays messages that let you know how they’ll be used when you do post, and a ‘Sell Your Stuff’ button to deep link you to where you can create a listing. Rather than allowing users to look at an empty new app and just dismiss it, Letgo makes it clear how everything will work once you get the ball rolling, and makes it as easy as possible to do just that.